When the State Meets the Street probes the complex moral lives of street-level bureaucrats: the frontline social and welfare workers, police officers, and educators who represent government's human face to ordinary citizens. Too often dismissed as soulless operators, these workers wield a significant margin of discretion and make decisions that profoundly affect people's lives. 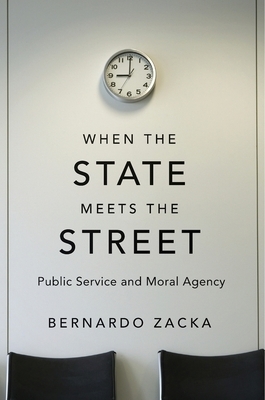 Combining insights from political theory with his own ethnographic fieldwork as a receptionist in an urban antipoverty agency, Bernardo Zacka shows us firsthand the predicament in which these public servants are entangled. Zacka's revisionary portrait reveals bureaucratic life as more fluid and ethically fraught than most citizens realize. It invites us to approach the political theory of the democratic state from the bottom-up, thinking not just about what policies the state should adopt but also about how it ought to interact with citizens when implementing these policies.